White tigers - 8 fast facts you may never have heard of before! 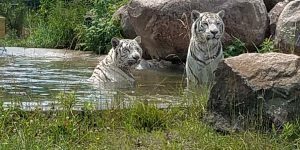 Home » 8 fast facts about white tigers – did you know? 8 fast facts about white tigers – did you know? In 2017, The Wildcat Sanctuary is currently home to FIVE white tigers. There have been others in the past and sadly, there will be more in the future. If white tigers are so rare, though, why are there so many in need of rescue? We hope you’ll learn these basic facts about white tigers. The more people know, the more they won’t support the exploitation that goes into breeding white tigers. White tigers are not a separate subspecies. They’re not Royal White Tigers. They’re not Snow Tigers. They’re not albinos. They’re simply tigers that are born with white fur. White fur is a very rare genetic mutation. It occurs in the wild possibly in as few as 1 in 10,000 wild tiger births. Normal tiger behavior in the wild prevents the kind of inbreeding that would be necessary to produce white cubs. Captive inbreeding of white tigers results in high neonatal mortality rates, typically exceeding 80%. Many tigers must be inbred multiple times to get the one perfect white tiger exhibitors like to market to the public. Where do those that aren’t “perfect” go? The average number of cubs born to get one healthy white tiger cub exhibitors want is 1 in 30. The other 29 cubs can typically be born deformed, or they’re considered the wrong color and euthanized, or they die shortly after birth due to genetic defects. Since the last known wild white tiger was shot dead in 1958, it’s the already inbred captive population we see today that’s being used for further breeding-for-profit. White tiger cubs were once being sold for upwards of $50,000 each. Now that breeders have produced so many, the price has dropped drastically and they’re no longer as valuable in the wildlife trade. Now that you know, what can you do? We understand their allure but we hope, now that you know the suffering behind the beauty, you’ll help educate others about the truth, too. We have other articles on our website explaining more white tiger issues HERE.